Our kids were completely surprised when we picked them up from school. “Why are you checking us out of school early?” they inquired. “You’ll have to wait until we get out of the school building and to the car,” we answered. Once in the car, the kids saw the packed suitcase, their stuffed animals, and information about Great Wolf Lodge. They bubbled with enthusiasm. Our daughter could not stop talking about how excited she was to be going back to Great Wolf Lodge. My wife had taken the kids to the Colorado Spring resort once before. 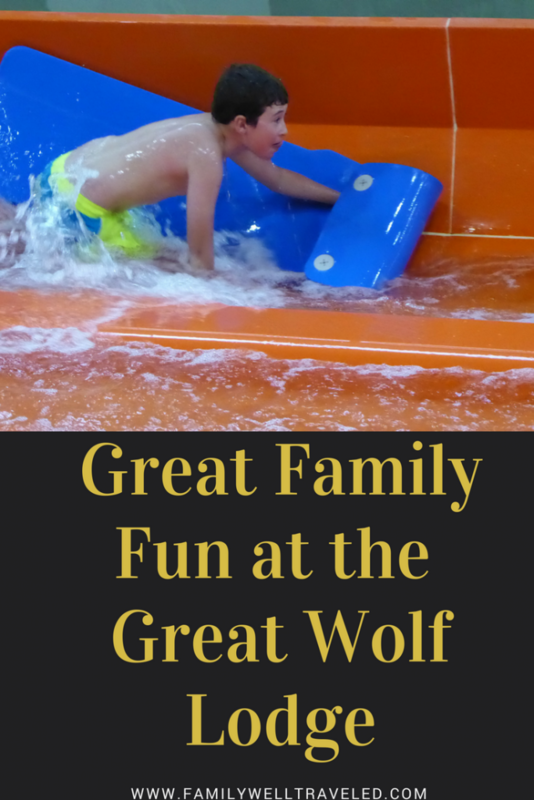 During that overnight stay, we had not purchased the Wolf Pass, limiting the activities for the family to some events like a story time (geared toward younger children) and lots of time at the water park. 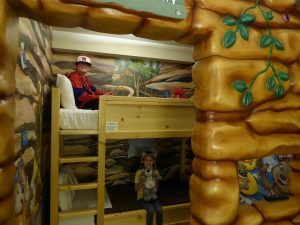 My wife promised the kids we would go back when we were able to get a room with bunk beds and a Wolf Pass, which allows the pass holder access to mini golf, a rock climbing wall, a ropes course, and many other features. We were returning, with what we had promised. Our family had a tremendously fun and busy time. The Lodge itself is full of rustic charm. 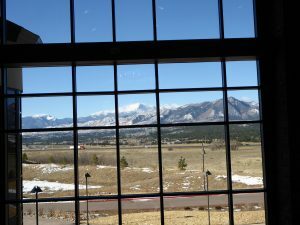 The lobby and great room have large vaulted ceilings with open windows looking out to Pike’s Peak. We had pre-checked into the resort, so the check-in process was smooth. However, it’s worth noting that there were long lines at times to register at the front desk. 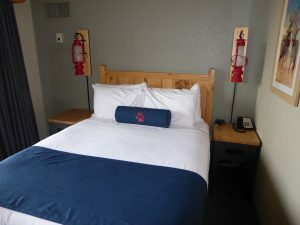 The Great Wolf Lodge Resort in Colorado Springs, CO. The resort has a number of restaurants offering American cuisine, pizza and buffets. There are options for family dining or adults-only atmosphere. The lobby also showcases the Forest Friends animatronics and many special events, from science labs, to cookie decorating, to morning yoga. There are a number of room options. On this visit, we stayed in a Junior Wolf Pup Den Suite. Our room was decorated in alpine accessories, including lanterns and wood framed beds and end tables. The kids had a cute den, with bunk beds and their own television. The bathroom was standard fare, but adequate for our needs. The room had a refrigerator, microwave, and coffee maker. 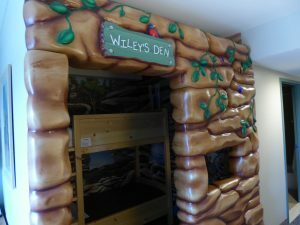 The kids slept in bunk beds in Wiley’s Den. 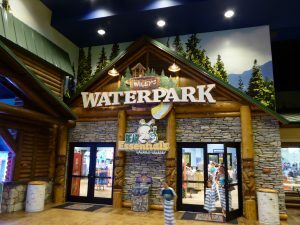 Of course, everyone going to the Great Wolf Lodge spends time at the water park. 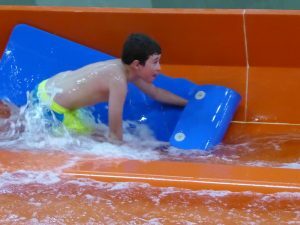 The indoor park features a wave pool, a toddler area, and a number of water slides. There are water slides for toddlers, and for the adventurous, including the Wolf Tail, where the floor drops out from under you plummeting you down several feet. The Mountain Edge Raceway lets you race three other people head first in a timed race. The Howlin’ Tornado propels you down large drops, followed by a funnel, flipping you in different direction so that you are at times facing forward and other times facing backwards down the slide. Alberta Falls jets you down a chute on a rapid current through twists and turns while on an inner tube with a partner. The center of the park features the tipping bucket, which fills with hundreds of gallons of water before tipping out the contents and soaking unsuspecting patrons. Before hitting the water slides, we visited the Bear Essentials swim shop, where the kids were able to get swim goggles. Cost: $9.99 but included in the Wolf Pass. The Adventure Park lies outside of the water park, and offers a number of activities for the family. It is a great escape from the more crowded water park. We opted for the Wolf Pass, which costs $99. However, the pass offers a tremendous savings over paying individually for each activity. The following activities were included in the Wolf Pass. 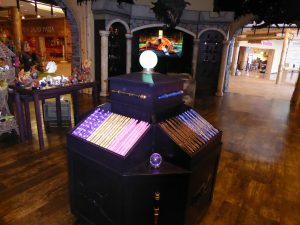 We first stopped at MagiQuest, where the kids each chose a wand and registered to play the enchanted game. There are three game choices which move the participants throughout the resort, waving their wands at computer monitors, treasures chests, or crystals to collect runes which they use to rescue pixies from death or to slay a dragon. Our kids enjoyed collecting their runes while hunting for the pieces along the fantasy journey. Cost: $17.99 for the wand and $14.99 for the unlimited game. Next, we stopped at the Creation Station, where our kids chose their animals and got set up for a Club Crew Adventure game. Our kids love their stuffed animals, and they really enjoyed picking the animals here. 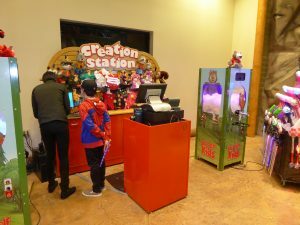 If you choose to play the game, your stuffed animal will receive a chip that activates computer terminals throughout the resort, allowing your child to solve a mystery. Cost: $34.99 for the stuffed animal (it costs extra to dress your animal) and $9.99 for the Club Crew Adventure game. Who’s up for a round of putt-putt golf? Our kids played the nine-hole Howl-In-One course. Our son tried unsuccessfully to golf under par, while our daughter – who is not naturally competitive – simply enjoyed the game without keeping score. The course is targeted toward young children (ages 3-8), but it was still a nice diversion for our older kids. Cost: $7.99 per round. The fun was still not over. With the Wolf Pass, the kids also got 10-frames of bowling at the Ten-Paw Alley. Our son actually went back the next day for another game to beat his first-game score (yes, he’s naturally competitive. And he did score better on the second game). Cost: $6 plus tax per game. We weren’t done yet. 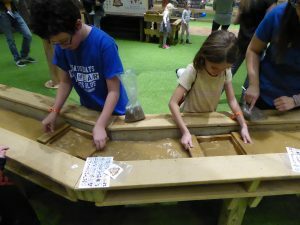 The kids next used their passes to get a bagful of dirt at Oliver’s Mining Co. They took the dirt to the water sluice and, washing away the dirt, uncovered a number of gemstones to take home. We came away with nice chunks of amethyst, calcite, and citrine. The kids look for gemstone treasures. To top off the night, we went to the candy store where the kids each got an empty cup to fill with jelly beans or salt-water taffy of their choice, included with their passes. Cost without the pass: $11.99 per cup. 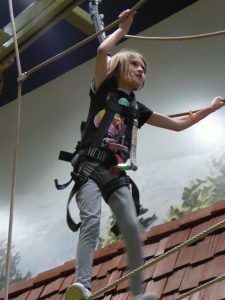 The following day, the kids faced their fear of heights on the Howler’s Peak ropes course. 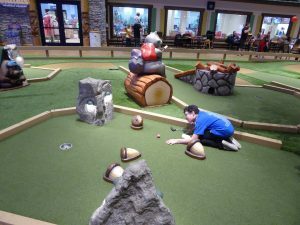 This was our son’s favorite activity and he used the unlimited feature on his Wolf Pass to go on the course three times. By the end of his third go around, his legs were shaking from all the activity. Cost: Single time is $12.99. Our daughter navigates the ropes. 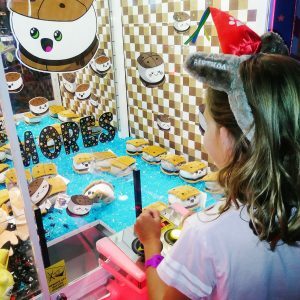 After some daring water park rides, we headed to the arcade, where the kids received 20 credits to play and collect tickets for prizes. The 20 credits disappeared quickly, but the kids still enjoyed Skee-Ball and other arcade games. Although our kids were pretty tired, their Wolf Passes were not yet exhausted. So they took some turns climbing the Rustic Ridge Rock Wall. 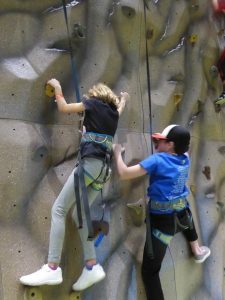 After spending time in the water park and on the ropes course, their strength was limited, but they tried their best to climb some of the course. Cost: single climb $5, two climbs $8, and three climbs $10. Since we were not going back to the water park for the remainder of our stay, the kids seized the opportunity to get their glitter tattoos. 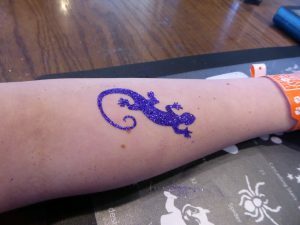 The tattoos last for about a week, and the kids were able to choose from a number of tattoos and glitter colors. Cost: $7.99. We had one last item on the Wolf Pass. As we left the resort, we checked out the gift shop, where the kids were able to get engraved leather bracelets. Cost: $14.99. We felt the Wolf Pass was well worth the money, and the kids were continually engaged with activities. 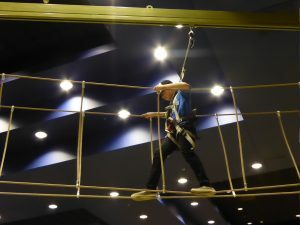 There are a couple of other options, including the Pup Pass and the Paw Pass, which are less money, but also include fewer activities (the ropes course and rock wall are not included with these passes). 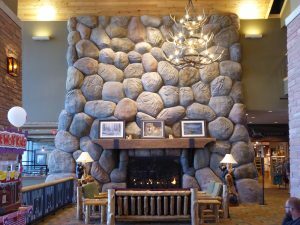 As another special treat, we booked a stay at the Great Wolf Lodge for our daughter’s birthday. We purchased the Birthday Bash for $99. 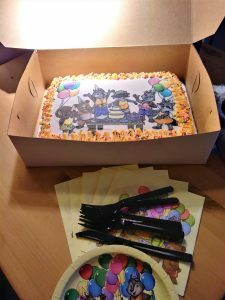 The package included cake, poster, balloons, birthday card, $40 arcade credit, and $40 dining credit. 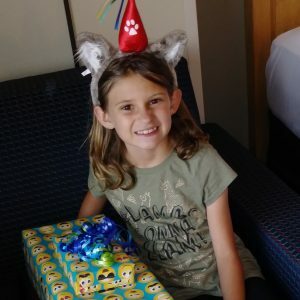 Our daughter felt special receiving her wolf ears with a party hat. 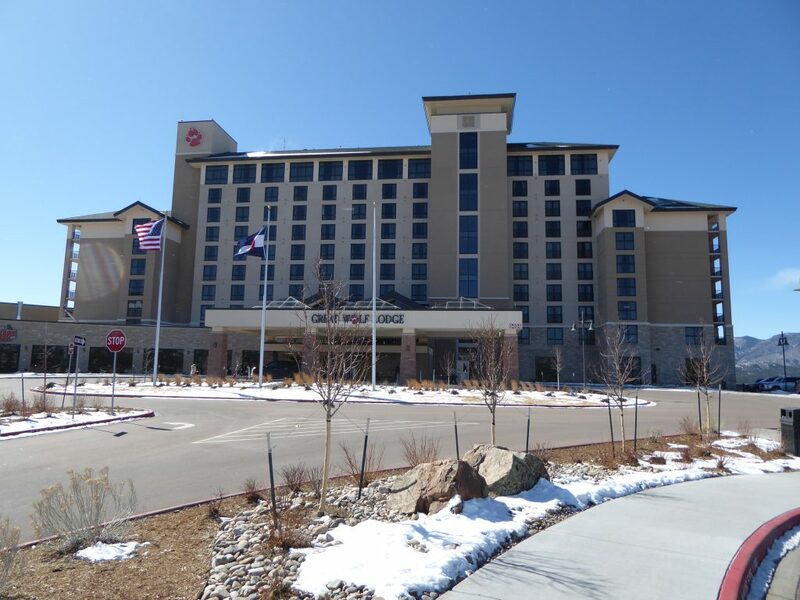 There are plenty of dining options within the Great Wolf Lodge Colorado Springs. 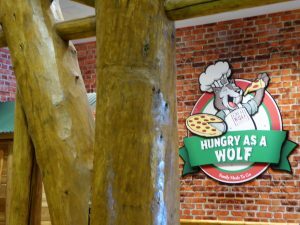 Our family usually chooses for a simple dining options, eating made-to-order pizza at Hungry As A Wolf. However, the Lodge also offers family buffet meals at The Loose Moose Family Kitchen. For those who prefer a more traditional sit-down restaurant, Barnwood Restaurant meets your needs. Of course, the Lodge also has a Dunkin’ Donuts which is perfect for breakfast coffee and donuts. And Ben and Jerry’s Ice Cream Parlor fills those late-night snack cravings. If you do not want to get out of your bathing suit, you have dining options within the waterpark itself. Buckets Incredible Craveables serves up burgers, dogs, fries and salads right next to the Slap Tail Pond wave pool. 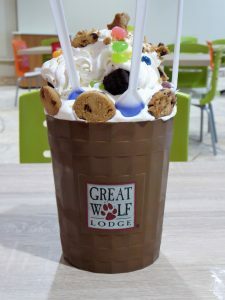 Our family loves to end our Great Wolf Lodge visits here with a Tipping Bucket dessert — soft serve vanilla ice cream, brownies, cookies, candy pieces and topped with chocolate sauce and whipped cream. The Tipping Bucket is a dessert-lovers dream (and a dentist’s worst nightmare). It’s big enough for four of us to share, and we have yet to finish one. Two times daily in the Grand Lobby, you can see the Forest Friends Show. 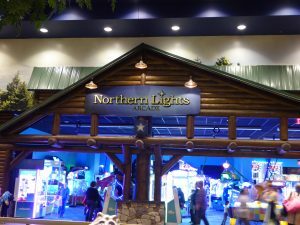 The animatronics show is a kid-friendly adventure featuring the woodland creatures of Great Wolf Lodge. They tell a tale and sing a couple of songs. After the Forest Friends Show, stick around for a story time, and a chance to meet, and get your picture taken, with one of the Great Wolf Lodge characters. Would we return to the Great Wolf Lodge? Absolutely. We had a great time. Although our kids are getting a little too old for the story time and Forest Friends Show, the water park provides continual fun. The addition of the Adventure Park adds a lot of activities and variety to a stay at the Lodge. Our visit to Colorado Springs’ Space Foundation Discovery Center. Denver is a short drive from Colorado Springs. Find 10 Fun Family Adventures in Denver. 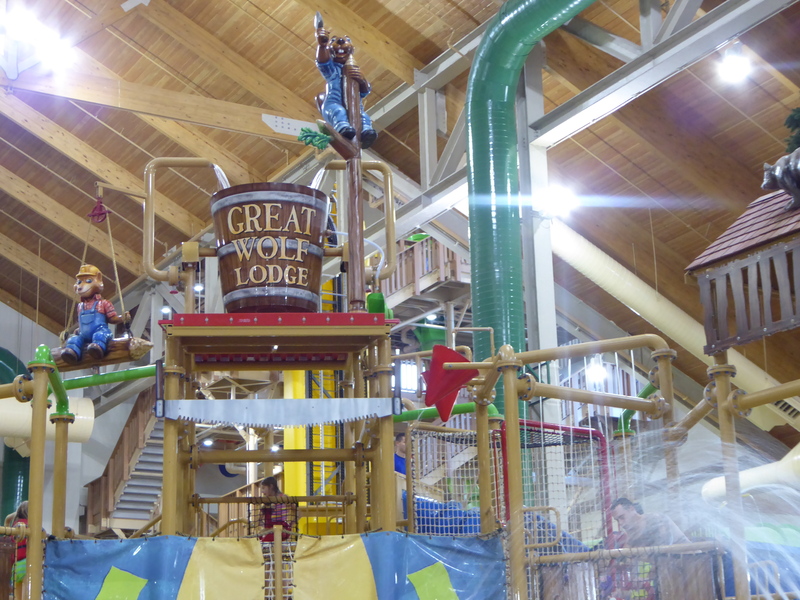 Have you stayed at a Great Wolf Lodge? What are your thoughts? Leave a comment and let us know what you think. I’ve never been to a Great Wolf Lodge but it looks like a lot of fun. A friend of mine takes her kids all the time and they always love it. I think if I had young kids I would for sure take them. Maybe I should take my niece before she outgrows it! Yes, do take your niece. 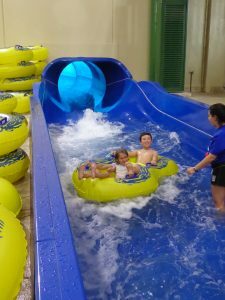 If our kids were still young I know they’d LOVE the Great Wolf Lodge experience. Maybe when we have grandkids we’ll spoil them! This looks like a perfect place for the people of every age. And especially for a family where everyone ‘s choices differ. My brother would definitely like to be in the GameZone while I would just like to laze around in the waterpark. This place is indeed a complete package . It does, indeed, give each family member opportunity to do something they enjoy. Really helpful that you included the price information too. Keep up the good work! Looks like a nice place to visit with kids, I may recommend it to my friends, their children would love it. There is a Great Wolf Lodge in my hometown and I have never been. Apparently I’ve been missing all the fun. My daughter would absolutely love this!! You should try it out someday. This looks a lot of fun for sure! My friends visit this place often (I believe they have one on the East coast as well). To answer your question, we haven’t been to one, but I think we should. But there is something in me that just doesn’t agree with taking a day off to visit this kind of places, and weekends are always far more pricey! I’ve never heard of the Great Wolf Lodge Resorts (I guess they are American? ), but they look like an amazing 1 stop shop for families to have tons of fun with a variety of activities. Will def keep it in mind for our LO should we ever find ourselves in an area with one. Yes, they have locations in the U.S. and Canada. So lovely of you to fulfil your promise with your kids! 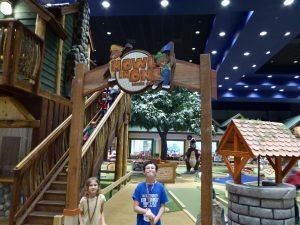 I can imagine how excited they must have felt knowing they will be returning to a place they’ve enjoyed visiting a while back.. 🙂 I love that Great Wolf Lodge had many enjoyable and kid-friendly activities. The Rustic Ridge and Howler’s Peak looks pretty exciting! 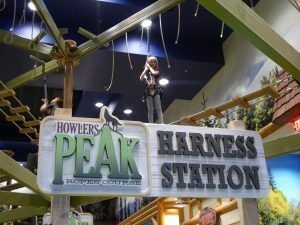 I think Howler’s Peak was our kids’ favorite activity. This place looks like so much fun for both little ones and grown-ups! Will keep it in mind! My daughter and her family love the Great Wolf Lodge near Seattle, Washington. We’ve never been but now, from this post, I can see why! Looks like your kids had a great time! I bet they were worn out. They slept pretty well after the trip. What family fun! I would have loved to visit here as we traveled through Colorado, but we missed out. 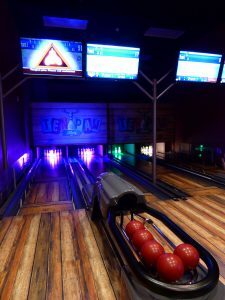 I love the theme and the bowling alley…fun. 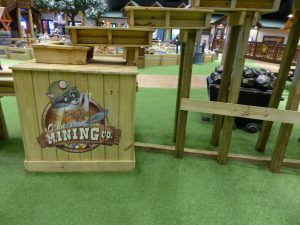 What caught my attention was the part about the Oliver’s Mining Co. Kids seem to be throughly involved in the water sluice and finding gemstones. Chunks of amethyst, calcite and citrine! Wow!! I would love to be there. We are a family that loves our gemstones. This sounds like a really nice Theme Park. I like that you seem to be rather active there – not just getting entertained on rides. I want a bunk bed like that, too! There is a lot to do and you are able to engage your mind in many different ways. I think we, as parents, did feel like kids again. It looks like you all had a lot of fun, particularly the kids 😊 Good on them for conquering their fear of heights! I have friends that go here every year – sometimes more than once. They absolutely love it! If it were up to our kids, I think we would go every weekend! The Great wolf lodge looks like a really fun place for kids. 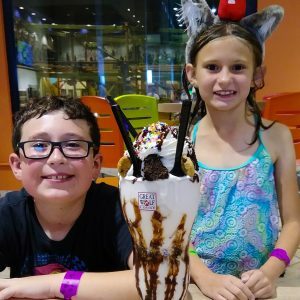 I would love to recommend this blog post to my friend she always looking for such places for kids. Looks like there is so much to do there even beyond the waterpark! The ropes course looks particularly fun! How fun! It definitely looks like a destination in itself. If I were a kid, I would definitely love the bunk beds, too! And who wouldn’t love an indoor water slide!? You can have water fun any time of the year! Yes. And the water is always warm! That makes me happy.